In 1898 Britain’s imperial power was peaking and British experimental psychology was just getting into its stride. 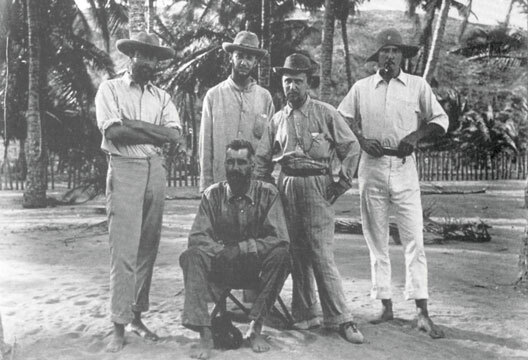 Led by anthropologist A.C. Haddon, the Cambridge Anthropological Expedition to the Torres Straits included, among others, Britain’s leading experimental psychologist, W.H.R. Rivers, ambitious William McDougall (still in his twenties), and young C.S. Myers, all canonical pioneer psychologists. Publication of the full six-volume expedition report took until 1935 (Vol. 1! ), covering language, culture, physical anthropology and artefacts. Luckily the first to appear (Vol. 2. Parts 1 & 2, Reports hereafter), in 1901, reported the psychological research undertaken by this trio, with anthropologist C.G. Seligman occasionally involved (mainly in Sarawak). I have discussed this in Richards (1997, 1998), concentrating on its role in the history of psychological studies of ‘race’ differences. In this article my focus is how the expedition exemplifies so many of the pitfalls that can afflict a psychology research project, and (equally important perhaps!) how even a virtuous virtuoso like Rivers can spin the write-up to maximum effect without outright dissembling. History’s eventual verdict was that the research (a) refuted Herbert Spencer’s hypothesis of ‘primitive’ superiority on basic psychophysical and psychological functions (except inferior pain sensitivity) due to greater energy allocation to these at the expense of ‘higher’ functions and (b) showed that, excepting a claimed deficiency among islanders in perception of the colour blue (which later proved erroneous), there were few major differences in performance compared to the ‘civilised’. Interestingly, this verdict took until about 1913 to crystallise (Richards, 1998). Spencer’s hypothesis was, implicitly, the default theoretical assumption, but none of the researchers were strongly attached to it. Fortunate though these conclusions were, close examination shows that, putting it bluntly, by current standards the findings barely proved anything. I must though stress very strongly that I am not attacking the researchers. Nobody could have done better, nor could most have done half so well. So what went wrong? Let’s start with the briefing of the participants and ‘experimenter effects’. Bearing in mind Spencer’s hypothesis we can see an immediate problem. The natives were told that some people had said that the black man could see and hear, etc., better than the white man and that we had come to find out how clever they were, and their performances would all be described in a big book so that everyone would read about them. This appealed to the vanity of the people and put them on their mettle (Reports I. p.3). Hence, if they prove their mettle by outdoing whites Spencer’s hypothesis is supported; if they underperform them their inferiority is confirmed anyway! This comes across strongly in McDougall’s research on pain sensitivity, in which participants, keenly exhibiting fortitude, ended up displaying only half the sensitivity of Europeans, thus confirming the ‘scientific racism’ stereotype. Methodologically, the naivety of the participants was seen as a virtue, since unlike Europeans they would take experimental tasks at face value. The price of naivety though was that the two parties were often clearly at cross-purposes. Thus, in Rivers’ research on colour-names, many simply named things they associated with a colour in a way reminiscent of Galton’s study of colours of the days of the week (Galton, 1883). And when we learn that one native assistant told villagers Queen Victoria would send a man-of-war to punish them if they did not respond entirely truthfully (Reports I. p.4) the temptation to describe the project as ‘gunboat psychology’ is hard to resist. To sum up then, Lesson 1: Do not brief participants so as to direct them to respond in a way favouring a specific hypothesis; Lesson 2: Naive participants have their own assumptions and hypotheses of which the researchers themselves may be ignorant. setting forth. Lesson 4: Check participants regarding physiological conditions relevant to the phenomenon being researched. Lesson 5: Admit defeat rather than use obviously unsatisfactory methods simply in order to get some data. data were perhaps generally less problematical, but E.B. Titchener (1916) argued that his finding of deficiency in blue-perception resulted from contrasting research conditions: a dimly lit hut versus a brightly lit laboratory. Later it was also suggested that the islanders confused colour and brightness (Berlin & Kay, 1969). Any control group data on this would thus, unknown to Rivers, have been irrelevant. One might also mention that Rivers’ major follow-up research, ‘Observation on the senses of the Todas’ (1905), again failed to find significant differences between this southern Indian tribal group and Europeans in sensitivity to visual illusions. Ironically, much of the control group research may, in retrospect, be seen as equally flawed and inconclusive as that done in the field. Lesson 6: Make sure your control group and procedures used are plausibly comparable to the experimental ones in relevant respects. Lesson 7 was that really this kind of research project was, for the time being, impractical; and indeed (bar Rivers, 1905) several decades elapsed before experimental cross-cultural research was resumed, and never on a comparable scale. More profoundly though, Lesson 8, certainly learned by Rivers, was that undertaking such research constitutes some kind of imposition of Western ‘scientific’ culture on another, hence biologically based differences can become inextricable from those due to socio-cultural factors. This issue became a leitmotif throughout psychology’s post-1920 history, currently becoming prominent in the context of debates around psychology’s globalisation and postcolonial psychology. Finally, a more positive Lesson 9. Mission completed, a report of the team’s findings had to be produced – that ‘big book’ promised to their participants. Enough has been said to indicate their problem. While part of a prestigious elite project, funded principally by Cambridge University, the Royal Society, and the British Association for the Advancement of Science (Rouse, 1998, p.58), it had, in truth, yielded precious little by way of hard, robust, scientific findings. The expedition Reports provide a master-class in how to manage this conflict – common, if on a humbler scale, in everyday research life ever since. First, they presented apparent failure as a positive gain – in this case, a major weakening of Spencer’s hypothesis and other scientific racism assumptions followed by learned speculation on how these might possibly be salvaged, i.e. not claiming to have falsified received wisdom, merely to have left it unconfirmed, nevertheless leaving the reader pretty convinced that, as hitherto played, the game was up. Science has thus advanced. Second, confession of all the setbacks conveyed a heroic impression of knowledge gained under fortuitous difficulties. While academically sober, much of the text remained an entertaining ‘ripping yarn’ from an outpost of Empire – Boy’s Own Psychology if you like. Thirdly, the team’s credentials were only enhanced by their exemplary display of scientific humility as to what could really be concluded from their findings. In sum, the rhetoric of writing-up is not the least of the skills a researcher needs, and the Reports are a classic of the research-report genre. It strikes me that there was an air of innocence about the initial spirit of the whole business, which the experience itself dispelled. What more appropriate an introduction the in than this tale of psychology’s loss of methodological innocence? Berlin, P. & Kay, P. (1969). Basic color terms. Berkeley, CA: University of California Press. Galton, F. (1883). Inquiries into human faculty and its development. London: Dent. Haddon, A.C. (Ed.) (1901–1935). Reports of the Cambridge Anthropological Expedition to Torres Straits. Cambridge: Cambridge University Press. Richards, G. (1997). ‘Race’, racism and psychology. London: Routledge. Richards, G. (1998). Getting a result: The Expedition’s psychological research 1898–1913. In A.Herle & S. Rouse (Eds.) Cambridge and the Torres Strait: Centenary Essays on the 1898 Anthropological Expedition. Cambridge: Cambridge University Press. Rouse, S. (1998). Expedition and institution. In A.Herle & S. Rouse (Eds.) Cambridge and the Torres Strait: Centenary Essays on the 1898 Anthropological Expedition. Cambridge: Cambridge University Press. Rivers, W.H.R. (1905). Observations on the senses of the Todas. British Journal of Psychology, I, 321–396. Titchener, E.B. (1916). On ethnological tests of sensation and perception with special reference to tests of color vision and tactile discrimination described in the reports of the Cambridge anthropological expedition to Torres Straits. Proceedings of the American Philosophical Society, 55, 204–236.